Pacific Gas and Electric, the troubled California utility, said on Wednesday that it would cut off power during dry and windy weather more frequently, trim more trees along its power lines and spend as much as $2.3 billion to reduce the risk of wildfires. 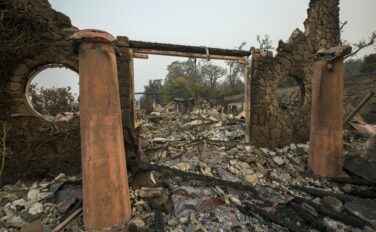 The company and other California utilities, whose equipment has been blamed for starting fires that have destroyed thousands of homes and killed dozens of people, detailed those plans in filings with state regulators in advance of the 2019 wildfire season, which starts in June. It was the first time the utilities had made such filings, which were required by a state law passed last year. PG&E submitted its plan a week after the company filed for bankruptcy protection in the face of tens of billions of dollars in liability from two years of deadly wildfires. The utility, the state’s largest, has blamed development in remote areas and climate change as major contributors to the severity of wildfires in its 70,000-square-mile service area. But the company’s critics assert that it has not done enough to reduce the fire risk posed by its power lines, conductors and other equipment. The California Public Utilities Commission will review the plans after holding hearings and soliciting public comments. Six utilities submitted reports, but experts say the commission will spend the most time on PG&E’s plan given the company’s financial problems and its size: The utility serves 16 million people in central and Northern California, or about 40 percent of the state’s population. Here are some of the highlights from PG&E’s fire plan. PG&E says it will become more willing to cut off power in areas that are very dry and where severe winds or other weather could cause equipment failures. The utility started using blackouts last fall. The utility said it would use computer models developed by San Diego Gas and Electric to figure out when to switch off electricity to vulnerable areas. In its nearly 200-page report, PG&E repeatedly cited the San Diego utility for its successful use of blackouts, enhanced weather tracking and other steps to prevent severe wildfires. PG&E says it will install 400 new weather stations this year, twice as many as the utility added in 2018. Mark Toney, executive director of The Utility Reform Network, which represents consumers, said blackouts should be a temporary solution.